MORE than 200 road side light posts along the newly-built Gerehu to Baruni road in Moresby Northwest need to be re-cabled to function properly. And the State would have to pay a staggering K4 million to replace them, only four months into use. This is because of a design flaw along a 10.7km stretch of the road that gives easy access to the main cabling and switch regulator resulting in vandalism and light post dysfunction. These were part of the findings of the special parliamentary committee on public sector reform and service delivery. 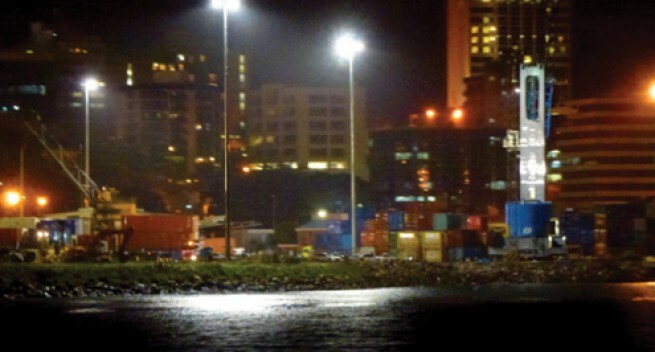 During a committee organised a media tour of Port Moresby last Friday, the committee’s head of secretariat Dr Bill Hamblin pointed out a host of peculiar instances relating to the misallocation of State-owned entities. It was identified that the light posts have all had the main cabling and switch regulator ripped out of a cabling panel only a metre off the ground, an identified design flaw that Dr Hamblin questioned. "Why are the most important light post panel which gives access to cabling so close to the ground and accessible with an average screwdriver?," he asked. Dr Hamblin added that the switch regulator should have been vandal-proof as it was the most lucrative missing component in the cabling that contained a sensor for detecting daylight and automatically switching the lights on in darkness. It was found that the State paid K20,000 for each light post – K12,000 per light post and K8000 per installation. Committee investigators said that as a result of the 200 vandalised light posts, the repair costs would be K4 million. Dr Hamblin said that the company charged with the light post installation should be probed on the design specifics of the light posts.